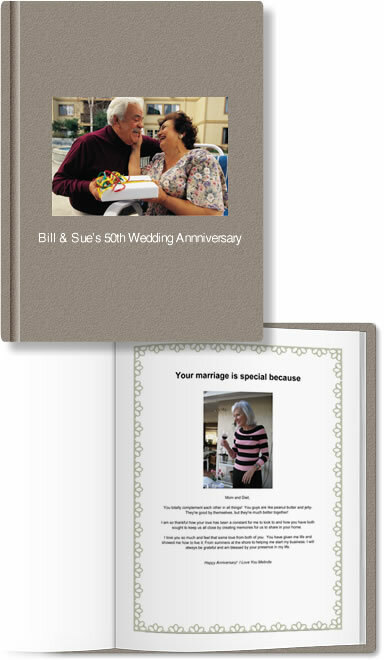 Give an anniversary gift that will be treasured forever! 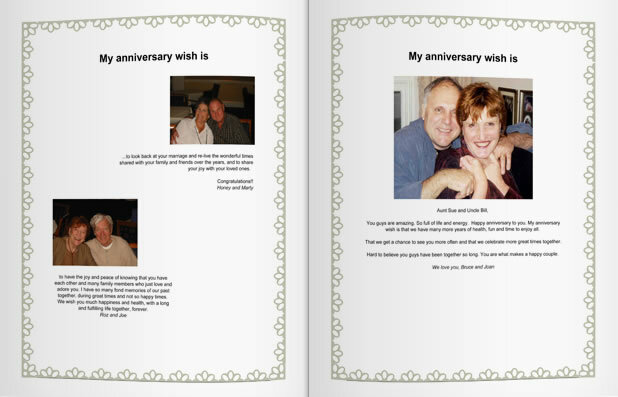 A personalized anniversary gift book filled with sentiments and photos from the couple’s family and friends. Create a coffee table quality book in three easy steps using our website, then invite others to add their thoughts, pictures and good wishes. 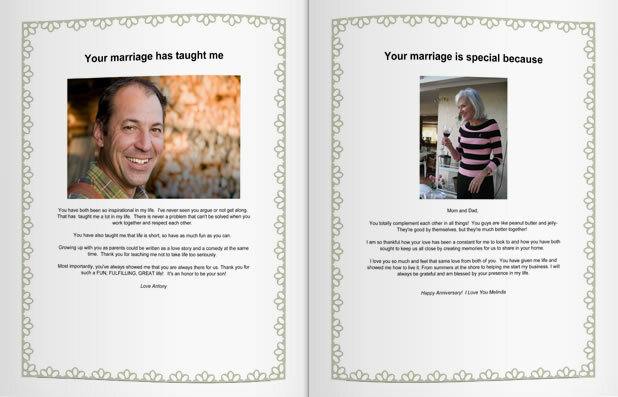 The book I made for my parent’s wedding anniversary is fabulous! They have friends all over the country and everyone could participate. Your reminder service is terrific. The weekly reminders it sent helped everyone remember to sign the book. What a great idea. This is the best present I have ever gotten my parents. What do you get a couple who has everything? Your anniversary memory book was the perfect choice. It was so easy to get friends and family to contribute. I loved doing it. More than anything, my parents absolutely loved their book. Thank you for such a wonderful service. I am recommending your CelebrateAHero.com to all my friends. 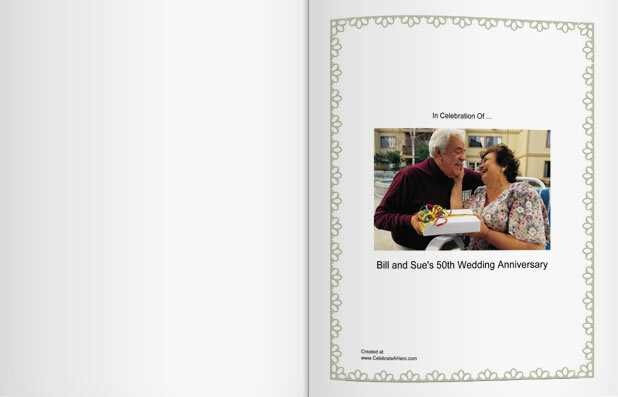 I just made a book for my parent’s 40th anniversary. I am very pleased with the way it turned out. I saw one of your books at a friend of mine’s house who got one for her 35th birthday. I decided it would be the perfect gift for my parent’s 40th the wedding anniversary. I was able to put the book together in only 2 weeks. I got 28 people to contribute their stories and memories. It is fabulous and when I presented to my parents last weekend, they were in tears. It proudly sits on their coffee table where they show it to all their friends. Thanks again for such a wonderful site and idea. My parents celebrated their 50th anniversary. I wanted to go the sentimental route when selecting a gift for them, but I was at a loss for ideas until I found your website. I decided to print up a book of memories for my parents. 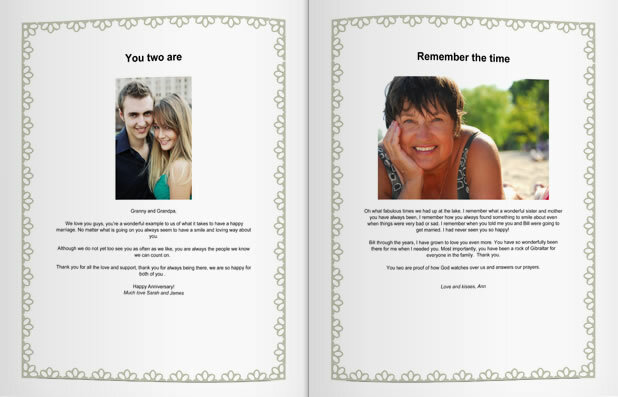 I was able to get many of my family members involved with my project simply by adding their special memory to my book through your website. With your help I was able to present my parents with a book filled with memories from their past as told by their siblings, including heartfelt wishes, and wedding pictures from 50 years ago. My parents absolutely loved the book! This book is not only a precious treasure to my parents, it will be a family keepsake for generations to come.